In yet another sign of the coming collapse of the Dollar as the sole international reserve currency, the World Bank issued its first bond denominated in the Chinese yuan currency in Hong Kong on Wednesday. The primary purchasers of the two-year bond were Hong Kong-based financial institutions, companies and wealthy individuals. While the issuance raised only 500 million yuan ($76 million), it provides further evidence that the the global economy is in search of alternative currencies to the diseased U.S. Dollar. The Chinese yuan currency is not currently traded on the global currency markets. 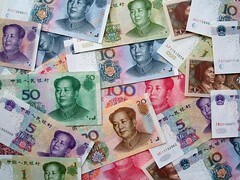 In recent months, however, Beijing has sought to encourage a more widespread use of the currency. In 2010, China began allowing foreign companies to issue debt denominated in the yuan. So far, the Asian Development Bank, Caterpillar Inc. and McDonald’s Corp. have used yuan-denominated bonds to fund their business activities within China. The ultimate endgame for China is to promote the yuan (also called the renminbi) to the status of a global currency, similar to the U.S. dollar and the euro. While the yuan is still years away from being able to displace the dollar in global trade, it is inevitable that the U.S. dollar will continue its downward trend which will require the rise of other currencies. The two contenders to watch closely in the coming years are the euro and the yuan.